Is there a minifig that has multiple arms that all have the ability to hold the weapons or tools? My 4yr old is asking for one lol. I thought maybe Doctor Otcopus, but can't tell by the pictures if his octopus arms can hold things. There are already quite a few multi-armed minifigures. I usually won't count Doctor Octopus as one, though. But I'll count it this time. The very first minifigure to be able to hold more than 2 tools is Doctor Octopus, from the "Spider-Man" theme from 2003. This was achieved by building a harness that goes on the neck. This version appeared in 3 sets, all in different variants. It should also be noted he received a 4+ figure version, which is aimed to kids 4 and above. This version is not exactly a "minifigure". His tentacle harness is built into the figure, and is not removable. This one was released in 2 sets. 2012 brings another Doc Ock, based on the Ultimate Spiderman TV show, using a similar trick as the 2003 version. This minifigure only appear in one limited edition set. 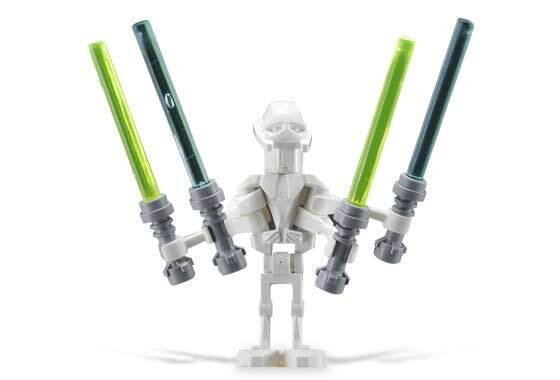 The next multi-armed minifigure is General Grievous from the "Star Wars" theme, hailing from the 2005 "Revenge of the Sith" subtheme. He was made out of a specialized head and torso; however, his legs and arms are common droid parts, with 4 of these arms attached to the special torso. This version appears in 2 sets, though one is more highly sought after due to Grievous having an exclusive cape in that one. Both versions came with his iconic lightsabers, but his arm poseability are rather limited; they only move sideways, and their wrists don't hinge. Grievous gets a re-release in 2010 as part of the Clone Wars Subtheme. This was, accuracy wise, a major leap. He was composed completely out of exclusive pieces. Now his arms hinge up and down, but like a lot of other LEGO robots, his wrists still don't turn. Also, his second pair of arms attach to the first pair, giving a rather awkward looking angle and less poseability. This version appears in 2 sets, though the second would only be released in 2012. Next, we have Frenzy. Frenzy is a Space Police Minifigure released in 2009. He was a large step forward to the original Grievous. He had a special molded head that goes over his regular, albeit uniquely printed, Minifigure torso. This extra head has a twist: it has room to accomodate a pair of droid arms, giving him 4 arms, although the upper two has little use, since their grip is permanently sideways. Still, it's a step up. Frenzy only appears in one set. 2011 brings about Samukai, the former king of the underworld of the Ninjago theme. Samukai is similar to the other skeleton soldiers, but with a massive head that, like Frenzy, fits over his torso and has room for arms. As an addition though, his upper jaw and lower jaw is separate, so he can open his mouth. His head is designed so it can snugly accommodate a second row of skeleton arms. Samukai's top-heavy stature caused by his head prevents him from getting his own spinner, thus making Samukai only appear in 2, very large Ninjago sets from 2011. In 2012, Garmadon, Ninjago's antagonist, becomes four-armed through less-than-known means. He is the one I truly consider the "first" four armed minifigure. He had a specialised body extension piece that goes over his torso, which is the same as the one in 2011, and a head that goes on that torso extension. He appears in 2 sets, both following suit as Samukai, in the sense that it appears in 2 very large sets. 2013 has a very similar Garmadon, except for a different helmet and staff. This variant appears in 1 set. Another Minifigure is four armed in 2013, and once again it is from Ninjago. He is General Kozu, general of the stone army. He also utilizes a torso extension like Garmadon, but a different mold. Like a lot of characters in the 2013 Ninjago wave, he is exclusive to 1 set. Last, but certainly not least, is another Star Wars minifigure named Pong Krell. He uses a similar torso extension as Garmadon or Kozu, but his alien head was incorporated to the extension. He carries his iconic twin double sided lightsabers, and, like many Star Wars figures, is exclusive to one set. I know this answer is pretty long, but it's very comprehensive. Please edit it if I miss something, or I wrote something wrongly. Bear in mind that all this minifigures can hold conventional minifigure tools. Best way to match minifigs and tell what set they are from? When were Star Wars minifigs changed to use more realistic skin tones?